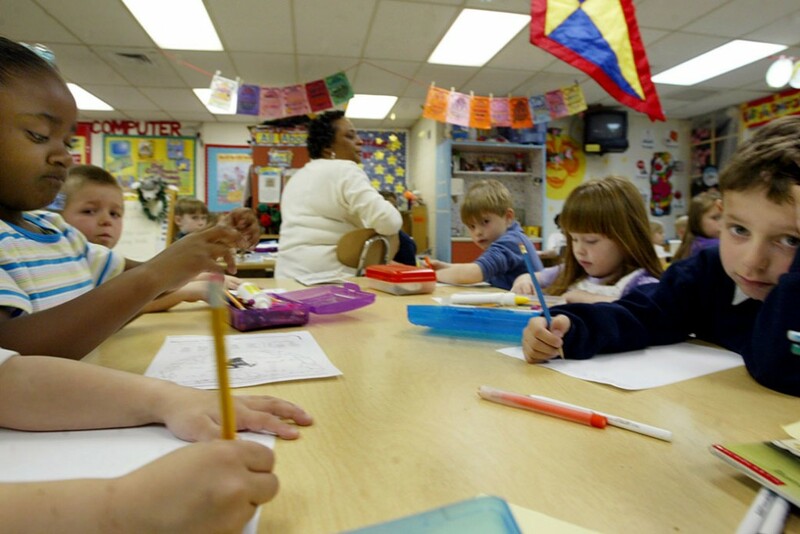 School segregation is rightfully back on the radar of Americans. From late night segments to trending podcasts, the media have given renewed attention to the fact that America’s schools are still deeply segregated by race and class. According to previous research by the Center for American Progress, most Americans—some 70 percent—believe that more should be done in order to integrate high- and low- poverty schools. Integrating schools by race must be an important policy goal as well. Yet America’s public school system remains deeply segregated and unequal in terms of both race and income. More than a third of all students attend a school in which 90 percent of their peers are of the same race. Furthermore, 40 percent of the nation’s more than 1,700 school districts are hypersegregated, meaning that most low-income students attend schools where 75 percent of the student body is also low-income. School integration is not just an ideal; it remains a difficult but essential means to creating equal opportunity for all children. Advocates who are serious about school integration should consider pursuing all strategies at their disposal, including consolidated regional school systems that make it possible to integrate schools at scale. Despite decades of school reform, too many racially and economically isolated schools fail to serve students well. Schools that primarily serve low-income students of color often have poor curricular offerings, few extracurricular and enrichment activities, and too many inexperienced teachers. Unsurprisingly, the prevalence of isolated, segregated, low-performing public schools is the most powerful driver of the persistent educational opportunity gap. This is by no means the fault of the students or staff who attend and work in these schools, respectively; there are many examples of individual schools effectively serving predominantly low-income students and students of color. Yet many states’ school finance systems have historically failed to direct adequate resources to schools that primarily serve poor nonwhite students. In order to give millions of low-income students of color the educational resources and opportunities they need and deserve, it is necessary to develop integrated schools that embody a unified and shared outlook for all students. Contrary to popular opinion, schools are not most segregated in the South but rather in large metropolitan areas in the Northeast and in the West—in places with hundreds of school districts that align with municipal boundaries and that reinforce segregated housing patterns. To successfully enroll large numbers of students in racially and socioeconomically integrated schools, policymakers must look beyond current school boundaries and work to consolidate school districts. Because of the legacy and persistence of housing segregation, in many densely populated areas, it is simply impossible to integrate schools within current district boundaries. For instance, Fairfield County, Connecticut, encompasses 24 separate school districts, including Westport, Easton, and Bridgeport. Overall, the county is diverse; however, unnecessary district boundaries make it impossible to integrate schools in the community. Fairfield County is roughly three-fourths white, 10 percent black and 17 percent Latino. Yet in 2017, 83 percent of the students enrolled in Westport schools are white. In nearby Easton, again, nearly 85 percent of the district’s students are white. Conversely, less than 1 percent of the students in Easton’s school system are black, and just roughly 12 percent are not white. Meanwhile, in the city Bridgeport—a short drive south of Easton—85 percent of the students are nonwhite. Demographic data for Essex County, New Jersey, just outside New York City, tell a similar story. The county is nearly evenly split between blacks and whites, but 90 percent of the students in Newark are nonwhite, while nearby Fairfield township enrolls zero black students. Again, nonwhite students and white students are separated by fairly arbitrary school district boundaries. This trend is common in metropolitan areas across the Northeast and Midwest. Consolidated school districts are possible to integrate simply because the larger geographic area can allow leaders to design attendance zones that are not confined by residential segregation. For example, in the 1970s, New Jersey’s Morris School District was forced to merge for integration purposes, and district officials continue to maintain an integrated school system today. Students still live in segregated neighborhoods, but elementary schools are successfully integrated, as less than 3 percent of students would have to change schools to achieve a perfect racial balance. White students in the district outperform white students across the state on all tests at all grade levels, and black students outperform other black students across the state on most state tests. Proponents of school secession movements understand the power of district boundaries all too well. Just as school consolidation makes integrated schools possible, school secession has proven to be a tool to keep the education of black and white and rich and poor children separate—most recently in Jefferson County, Alabama, and in Shelby County, Tennessee. Since 2000, 71 communities have tried to secede from their school districts. 47 of these efforts were successful. While district consolidation can make integration possible, there must also be community support and political will among leadership. This is not to say that integration is a panacea for all of the nation’s current education problems. State and local leaders, advocates, and educators must work to continue to raise the quality of instruction for all students and to make sure all schools are fairly funded. While these other elements of school reform remain important, it is unclear what effect they will have if the fortunes of black and white and affluent and poor children remain separate. Because of the persistence of structural institutional racism, school integration is an essential first step toward giving all children the quality public education they need. Abel McDaniels is a research assistant for K-12 Education at the Center for American Progress.